We introduce the first program synthesis engine implemented inside an SMT solver. We present an approach that extracts solution functions from unsatisfiability proofs of the negated form of synthesis conjectures. 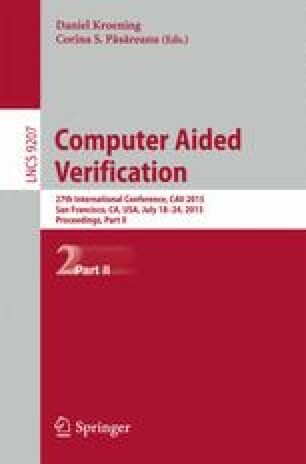 We also discuss novel counterexample-guided techniques for quantifier instantiation that we use to make finding such proofs practically feasible. A particularly important class of specifications are single-invocation properties, for which we present a dedicated algorithm. To support syntax restrictions on generated solutions, our approach can transform a solution found without restrictions into the desired syntactic form. As an alternative, we show how to use evaluation function axioms to embed syntactic restrictions into constraints over algebraic datatypes, and then use an algebraic datatype decision procedure to drive synthesis. Our experimental evaluation on syntax-guided synthesis benchmarks shows that our implementation in the CVC4 SMT solver is competitive with state-of-the-art tools for synthesis. This work is supported in part by the European Research Council (ERC) Project Implicit Programming and Swiss National Science Foundation Grant Constraint Solving Infrastructure for Program Analysis. This paper is dedicated to the memory of Morgan Deters who died unexpectedly in Jan 2015. We would like to thank Liana Hadarean for helpful discussions on the normal form used in cvc4 for bit vector terms.